The government claims Burundi is safe, that political disagreements have been resolved, and that the people want term limits removed ahead of 2020. 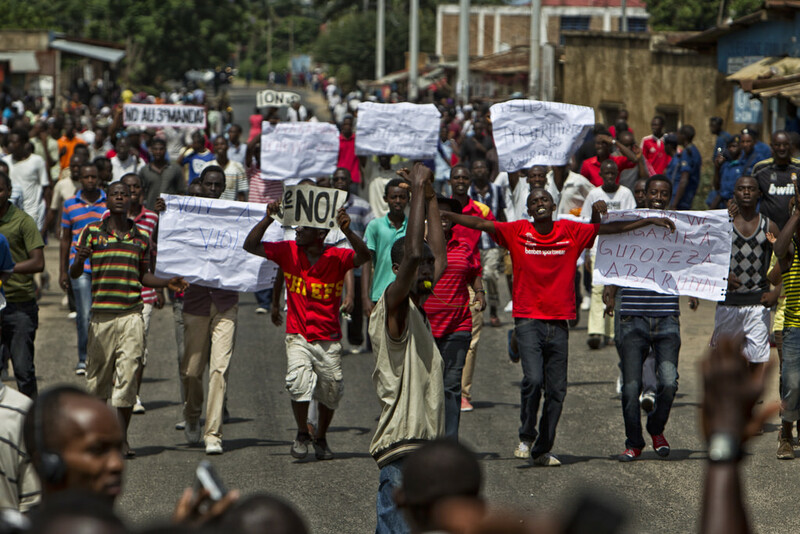 People protest against President Nkurunziza’s decision to run for a third term in 2015. Credit: Igor Rugwiza. Two years since Burundi was plunged into violent political crisis, there are two diametrically opposing narratives being told about the current situation. If you listen to the government, the country has recovered from the clashes and mass displacements that engulfed it from 2015. Things are now secure and back to normal, they say. However, listen to local human rights groups or international observers and a very different picture emerges. Earlier this month, the UN Security Council expressed its “deep concern” over Burundi’s worsening humanitarian situation. In June, a UN commission of inquiry emphasised the “persistence of serious human rights violations in a climate of widespread fear”. 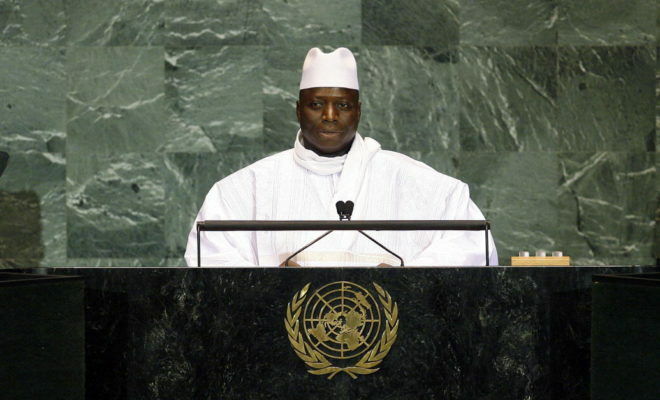 Meanwhile, a recent report by the International Federation for Human Rights (FIDH) claimed the ongoing crisis has now left at least 1,200 dead and seen the imprisonment of 10,000 people for political reasons. This disagreement is not just a battle over narratives, but over the actions now needed to move Burundi forwards. Burundi descended into crisis in April 2015 when President Pierre Nkurunziza announced he would run for a controversial third term. Mass protests ensued, followed by a failed coup in May. Despite claims the move was unconstitutional, Nkrununziza went on to contest and win the July 2015 elections. Violent attacks and assassinations followed. Hundreds of thousands of people were displaced, news outlets were shut down, and foreign journalists expelled. In response to this deadly turmoil, several international and regional organisations demanded that the Burundian government and opposition engage in a dialogue to restore peace. Proper talks, however, have never taken off. Despite arranging four rounds of negotiations, regional mediators from the East African Community (EAC) have failed to get the government and opposition at the same table. The ruling CNDD-FDD insist that they will not negotiate with members of CNARED, the main opposition coalition in exile, accusing them of participating in the failed May 2015 coup. “The process is moving slowly owing to the reluctance of the Government of Burundi to talk to its opponents,” said former Tanzanian president Benjamin Mkapa, the lead facilitator of the negotiations, in a statement this May. Earlier this month, a delegation close to the government reportedly held near-secret talks with representatives from the opposition in exile in Finland. Some are optimistic that this suggests a revival of the talks, but the government distanced itself from the reports and the outcomes remain to be seen. In Mkapa’s recent statement, he also expressed particular concerns over the government’s demands to “repatriate” the dialogue to Burundi. He explained that the CNDD-FDD is now resisting the externally-mediated talks, claiming that security conditions have been met and that questions around the constitution and 2020 elections have already been answered internally. Indeed, on 12th May, the government received an 86-page report submitted by the National Commission for Internal Dialogue (CNDI) on these political matters. The body had been established unilaterally by the regime in October 2015 in order to consult the population. The researchers surveyed the opinions of 26,000 citizens and came up with recommendations. Foremost among them is a proposal to change the constitution. According to the commission’s chair, Bishop Justin Nzoyisaba, “The majority of Burundians consulted support the suppression of the presidential term limits and stand for the amendment of the constitution”. This apparent finding has led to a shift in the government’s focus, from the peace talks to the 2020 elections. Upon receiving the report, President Nkurunziza appointed a national commission to propose constitutional changes. In June, Burundi’s Ombudsman organised political retreats to discuss the outlook for the 2020 polls, the political and security situation, and the possibility of amending the constitution. Furthermore, on 1 July, the anniversary of Burundi’s independence, Nkurunziza launched an election fundraiser. He called on citizens to help raise money so that the country would not have to rely on international support as was the case in 2015. “They promised to help us organising 2015 elections, but they suspended their funding just one week before the elections took place,” he said. Removing term limits for Burundi 2020? The government’s insistence that Burundi is stable and its growing indifference towards external peace talks have alarmed regional mediators. Opposition and civil society activists are also critical of the government’s approach and plans. Jean Claude Nkundwa, a local conflict resolution expert, says the government is deliberately trying to avoid external involvement. Amongst other things, he says that the Nkurunziza administration’s intention is “to exclude political opponents in exile from 2020 election process”. Charles Nditije, chair of CNARED, also claims that the government is trying to shrug off observers and deceive the Burundian people and international community into believing that the past disputes have already been settled. “The government plans to distract us from our commitment to resolve the current political crisis,” he says. According to the UN, there are over 200,000 internally displaced persons in Burundi. Three million people are in need of humanitarian support. And over 416,000 Burundians are seeking refuge in neighbouring countries and are too afraid to return. The worry now is that Nkurunziza is taking advantage of the very uncertainty created by his 2015 bid for power in order to try it all again in 2020.